Building brand awareness is not simply about delivering ads to potential customers but creating consciousness of the company, making sure that customers will not only recognize the brand's image but also will associate it with certain products or services. Having a vast amount of product available on the market, a differentiated message is vital in order to create an audience that can distinguish the brand from its competitors. Promoting brand awareness is especially important at the start of a new company to make sure people know about the existence of the product and they can choose it over other similar ones. Facebook Ad targeting, with its 2.27 billion monthly active users is one of the most potent tools in your marketing arsenal. Targeting those advertisements correctly, however, is a critical step in the process that can transform the way you connect with your clients. Do you want to build a brand for your product or service? You need to find the right audience to deliver your ads on Facebook successfully. How do you market your lifestyle brand? You likely don't have a physical value proposition that makes your product an absolute prerequisite. Instead, your messaging is generally aspirational. Marketing to people's aspirations can be incredibly powerful, but it also drives up the complications for your marketing strategy--and the solution starts with finding the right audience. What Do You Need to Know About Audiences for Brand Content? Lifestyle brands tend to be cultural. They latch on to the norms, customs, and aspirations of a specific subculture and market their services to them. Your target must at least partially depend on your current niche and the aspirations surrounding it. They tend to have discretionary income. They are able to look beyond their basic needs and purchase products based on their specific aspirations. They feel a strong group connectivity. The more your brand aligns itself with a specific culture or subculture, the more products you will be able to sell. They consume much of their content online. The rise of influencer and in-depth online content has provided opportunities for lifestyle brands to easily insert their voice into the conversation, which is something you can take advantage of. Knowing these characteristics, you can develop a Facebook targeting strategy designed to reach the audience your business most needs. It's complex, utilizing all the levers of Facebook's powerful Ads Manager tool. Your Facebook targeting efforts start with demographics and interests. Start by researching targeting options specifically for your brand and industry. You might, for example, take a look at age range, geographic area, or general household income and how they influence potential customers toward your brand. Next, allow behavioural targeting to enter the foreground. This is where you can rely on Facebook's third-party data to pull the previous actions of your potential audience. For example, you can choose to focus only on people who have recently clicked on the call to action button 'shop now'. Additional Interests are even more compelling as they help you choose from pre-existing 'packages' like fashionistas, which puts together a specific pattern of behaviours that Facebook recognizes as being performed by people who have interests much like the ones you need. Finally, don't underestimate the value of Custom Audiences. This unique approach allows you to use tracking pixels to retarget recent visitors to your website. Alternatively, you can upload a list of your current customers and target only those Facebook users similar to your existing customers using lookalikes. Custom Audiences take time to learn, but carry powerful possibilities for your lifestyle brand. A couple of years ago Facebook's introduced a new advertising optimization objective called Brand Awareness, whose main aim is to get the ads in front of the actual people who would most likely to stop scrolling, look at them as well as notice them - meaning the person who saw the ad will remember even a few days later. This objective is great to have more insight to which variation of the message works best with your target audience. It can be difficult to find exactly the audience you're looking for. It may take some trial and error to determine the target that is exactly right for your business. As a result, there may be times when you struggle to see the results of your highly targeted ads. Many users, in fact, struggle to figure out how to use Facebook Ads effectively. All too often, these business owners walk away from Facebook Ads altogether. ‍You may start with a target that is too vague. A vague target will leave you with the same problem as throwing out a random ad and hoping for the best: it won't end up in front of the right person. Many people, for example, may choose to focus only on vague demographics, or they may fail to fully understand their customers' interests. Unfortunately, this can leave you feeling as though ad targeting simply isn't working for your business when, in fact, you've just missed the mark on your targeting. ‍A Facebook Like doesn't necessarily indicate genuine interest in a product. People who indicate an interest in MMA aren't necessarily out there training hard, burning through boxing gloves and wraps several times a year. People who have martial arts training apps installed, on the other hand, likely do actively engage in training--and as a result, you'll find that they are far more likely to purchase your product. In many cases, people show interest in certain activities, but fail to engage in those activities--or at least, they aren't putting their money into those products. You want your Facebook Ads to target customers who are more likely to actually make purchases, not just the ones that liked a competitor page a long time ago for a contest. If you're struggling to create the highly-targeted Facebook Ads you need to reach your ideal audience, we can help! Our Audience Finder tool offers a number of key advantages that can help you overcome some of the biggest difficulties faced by Facebook Ad creators with ease. Get your ads highly targeted every time. Since it's based on apps that mobile users already have installed, you'll know that you are targeting to an audience that is highly likely to be interested in your product and having a genuine use for it. 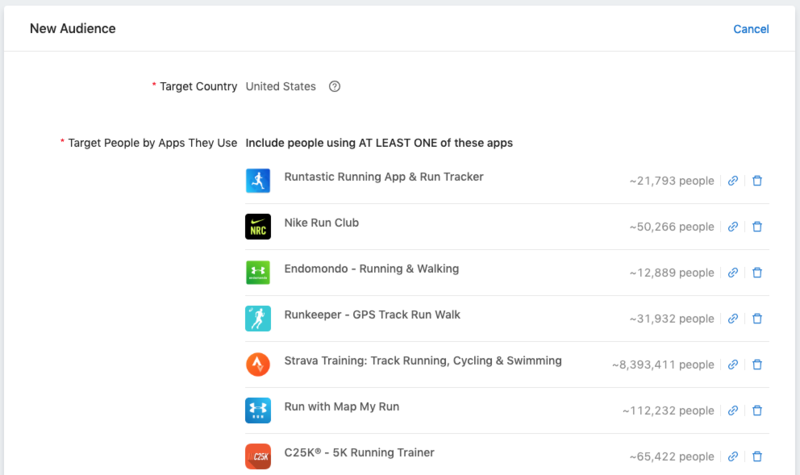 If you target a person with a running app installed, for example, you'll know that they genuinely need good running shoes. A woman with that running app installed likely has a genuine interest in quality sports bras. With the Audience Finder tool, you'll be able to more effectively target exactly the customers who need to see your ad. ‍You'll cut down the time spent sifting through Ad Targeting options. With Audience Finder, you'll get a better idea of exactly who your customers are and what they need. In many cases, you can cut down on the effort required to target your ads. Audience Finder gives the best results when it's used in conjunction with other Ad Targeting options; however, it can help narrow down your target much faster. ‍Build lookalike audiences in a snap. Lookalike audiences are an incredibly valuable tool for your business--and with Audience Finder, you can build those valuable look audiences faster and more effectively than ever. ‍Exporting custom audiences is a snap. With one click, you can easily export your targeted audience straight to Facebook, freeing up your time to handle other aspects of your marketing campaign. Do you need a tool that will help with your Facebook Ad targeting, taking it to the next level and enabling you to more easily connect with your customers? Are you tired of putting together ad campaigns that fail to reach the full return you were hoping for on your investment? If you're ready to try something new, contact us today. We'll give you access to our valuable Audience Finder tool and provide you with more information about how this valuable tool can help shape your business's marketing strategies. Step Three: Create Your Facebook Advertising Campaign. Once you have exported your custom audience list from the Audience Finder to your Facebook Ads account, you are ready to finish setting the parameters of your advertising campaign. To define your audience as specifically as possible, we recommend adjusting any of the standard location, demographic, and interest-based targeting tools provided by Facebook. Combine Audience Finder audiences with Facebook Ads to reach your business goals at better costs. You can use the Audience Finder for free with our 14-day trial and find how it can power-up your marketing efforts! Should you have any questions, send us an email at info@42matters.com. Audience Finder can provide audiences with a higher granularity and stronger intent. Ideally, combining both Facebook Targeting and Audience Finder’s results will give you a more effective ad targeting strategy that will place your ads directly in front of the right people. 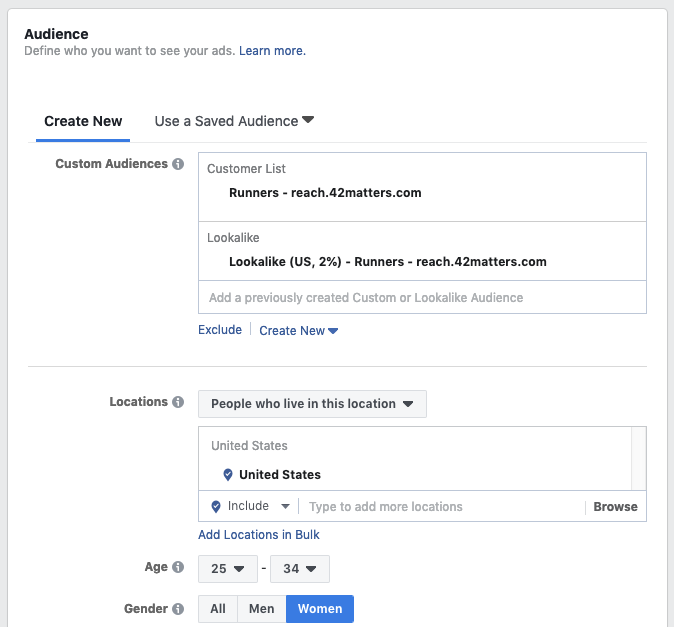 Laser target audiences, lift your marketing game to the next level and attract more customers for your online store .In this article we show you several tips on how to do that with 42matters' Audience Finder and Facebook Ads. How can you reach runners on Facebook? How to find customers for your running gear or people for your running event? Read this article to get tips and tricks to find your best audience!